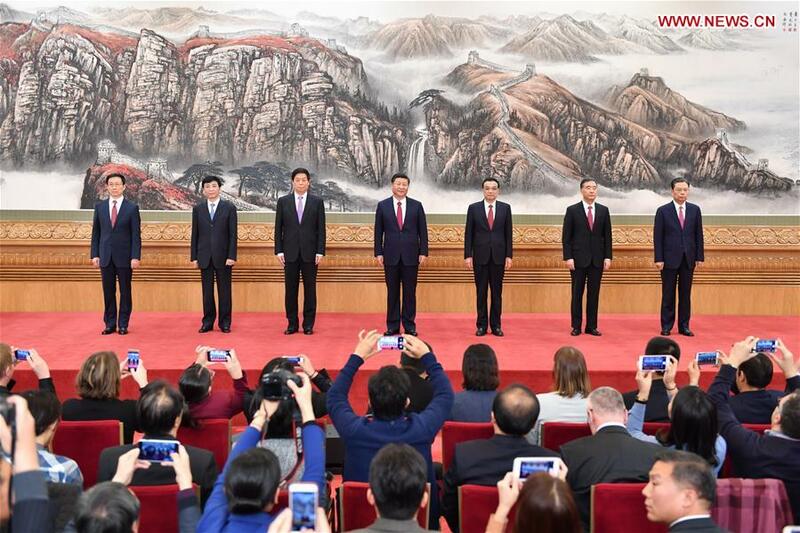 BEIJING, Oct. 25 (Xinhua) -- The Communist Party of China (CPC) unveiled a new leadership line-up Wednesday to lead the world's most populous nation toward a great modern socialist country. They were elected at the first plenum of the 19th CPC Central Committee following the 19th CPC National Congress, a new historic starting point for the Party to realize its ambitious blueprint for the nation's great revival. During the twice-a-decade congress which concluded Tuesday, the CPC declared a "new era" of socialism with Chinese characteristics. It enshrined Xi Jinping Thought on Socialism with Chinese Characteristics for a New Era into the CPC Constitution as a new component of the Party's action guide. Xi was elected general secretary of the CPC Central Committee for the first time at the first plenum of the 18th CPC Central Committee in late 2012. At a key plenum of the CPC Central Committee in 2016, Xi's status as the Party's core was endorsed. Before him, Mao Zedong, Deng Xiaoping and Jiang Zemin had been given the core status. The new CPC leaders who took the stage Wednesday are the helmsmen leading the Chinese toward the country's new era goals of basically realizing socialist modernization by 2035 and building a great modern socialist country by the middle of this century. "The leadership reshuffle of the CPC, the world's biggest political party, is an answer to the needs of the Party and the nation for the development of their causes," said Yang Fengcheng, professor at Renmin University of China and a researcher on CPC history. "The new CPC leaders are good at learning and bold in practice," said Yang, who is also chief editor of the book "Keys to the Success of the Communist Party of China." For the first time, all Standing Committee members of the Political Bureau were born after the founding of the People's Republic of China in 1949. They began their political careers around the time of the launch of reform and opening up in 1978, which imprinted them with the mark of the era when China's economy began to take off, following a decade of turmoil during the Cultural Revolution (1966-1976). As a staunch reformist, Xi has launched more than 1,500 reform measures over the past five years -- unprecedented in their coverage and depth. The other six Standing Committee members have also been active practitioners of reform and opening up policies. Either at the central government or the local level, all members have driven an array of major reforms, explored theories, and solved deep-rooted problems with open minds, foresight and innovative thinking. The new leaders are widely seen as having firm ideals and convictions, strong loyalty to the Party and deep love for the country. All of them have received higher education and demonstrated in-depth understanding of philosophy and strategic thinking, with a relatively high level of theoretical thinking. Many have published academic papers, or even books, during their careers. The seven leaders have accumulated rich experience in practice. They are viewed as having a good sense of the times and caring about the people. Xi, for example, started his political career 44 years ago. Over the past five years, he has spent 151 days on 50 local inspection tours around the country. Other leaders also have extensive experience working at the grassroots level and have been promoted to senior posts due to their excellent performance and good reputations. Most of the seven leaders have worked in both well-off coastal areas in the east and less-developed central and western regions. A number of them have played pivotal roles in the fight against poverty and successfully tackled difficult and risky issues in the fields of economic development, people's welfare, urban management, the anti-corruption campaign and industrial transformation. Moreover, the new leaders have a deeper understanding of opening up and win-win development, with broader global vision and abundant experience in dealing with international issues. For the past five years, the CPC leadership has been seen as a major driving force behind economic globalization. "The new CPC leadership is a strong, goal-oriented team with acute awareness of problems and the ability to stand firm in practice," said Han Qingxiang, a professor at the Party School of the CPC Central Committee. "They have been flexible and at the same time principled when dealing with problems. They have never forgotten why they started and have always pressed forward in the face of challenges at home and abroad," he noted. Chen Yiwei, a delegate to the congress, is full of hope. "The new leaders have rich experience and a strong sense of responsibility," he said. "I believe that with the guidance of the latest achievement in adapting Marxism to the Chinese context, they can lead the Party and the nation to blaze new trails, overcome difficulties and accomplish the glorious missions in the new era."